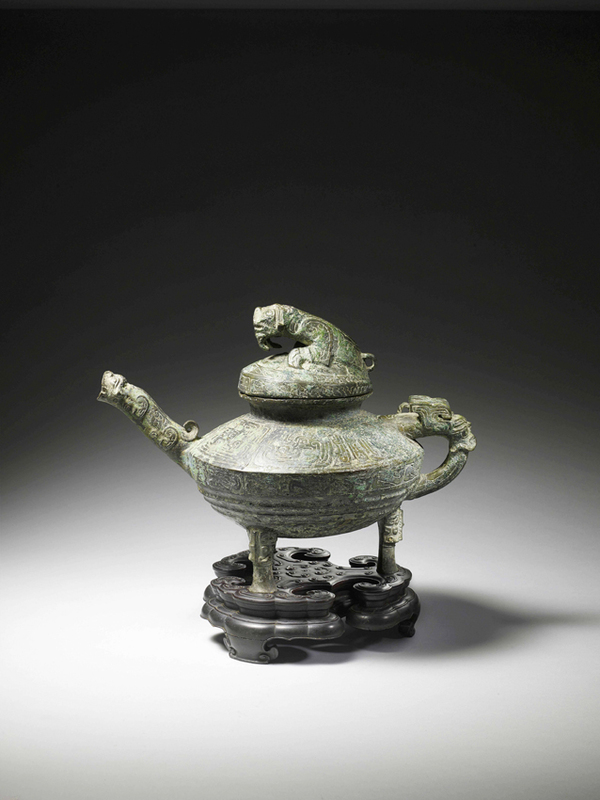 An exceptionally rare Western Zhou bronze, taken when the Summer Palace was sacked by British troops in 1860, has sold for £410,000, four times its lower estimate. Telephone bidders vied with buyers in the room at the Canterbury Auction Galleries this morning (Wednesday, April 11), with bids starting at the low estimate of £120,000, quickly exceeding the top estimate of £200,000. Bidding slowed at £320,000, but auctioneer Cliona Kilroy managed to drive bids up in £10,000 increments, to eventually put the hammer down at £410,000 to a telephone bidder. Only six similar archaic vessels, or ying, are known to exist. Discovered in a Kent seaside town, the seventh vessel has previously unrecorded decoration. It had been found by Alastair Gibson, London dealer and the Canterbury saleroom’s Asian art consultant, together with three Qing bronzes and an archive of letters and photographs relating the military history of the Evans family of Monmouthshire. China’s cultural heritage department had protested at the sale, asking for the object to be returned – a standard response by the country when items looted from the Summer Palace come up for sale. It said the bronze ying was an “illegally discharged cultural relic” but Canterbury went ahead with the auction.